only meat and potatoes are mentioned. I may be wrong but stew sounds like a dish that you eat the soup with a spoon, but we almost never do that with nikujaga. Sometimes I simmer this down until very little soup is left in the pot. This is meat and potatoes simmered with other ingredients (typically carrot, onion and konnyaku noodles) in sweet-and-salty broth. 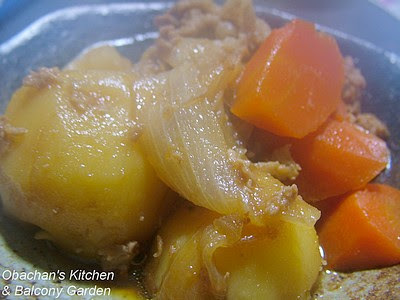 Hearty, typical Japanese winter dish. Yummy! I use the kiri-otoshi cut of beef for mine. The name amuses me, since it's also a cut we learn in iaido. i can't tell you how excited i was to see this post. i've yet to find a nikujaga recipe that is totally satisfying. hope you don't mind me stealing yours once youve posted it. Wow, I didn't know that the word "kiri-otoshi" had anything to do with iaido. Mmmm...live and learn. :) Thanks for the info.